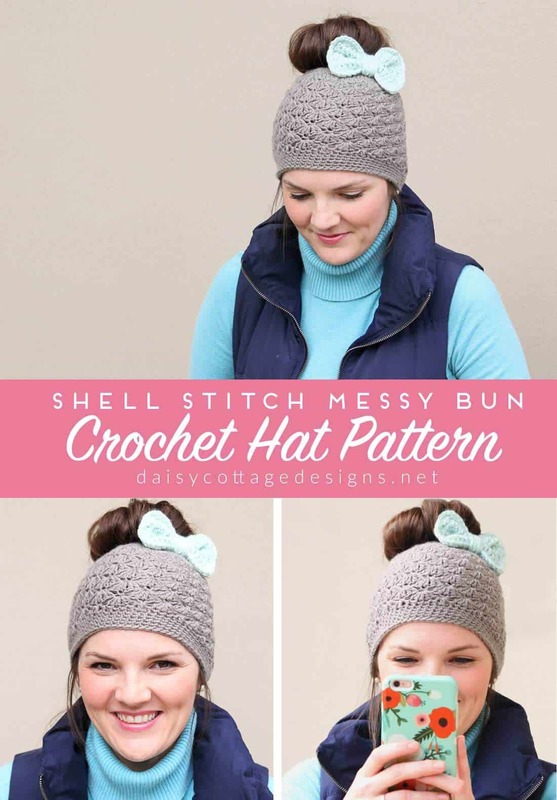 I was planning a pattern for a baby bonnet last night, and while I was doing that, I got the inspiration for this shell stitch messy bun crochet hat pattern. 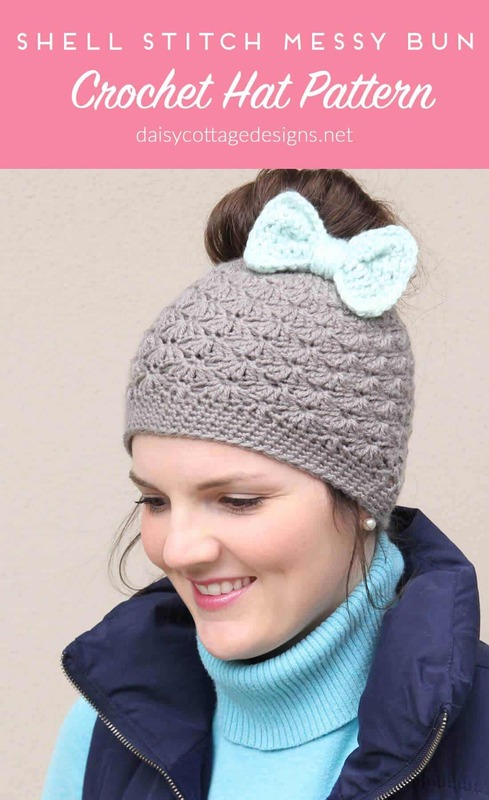 The shell stitches work up quickly, and the finished project is adorable! 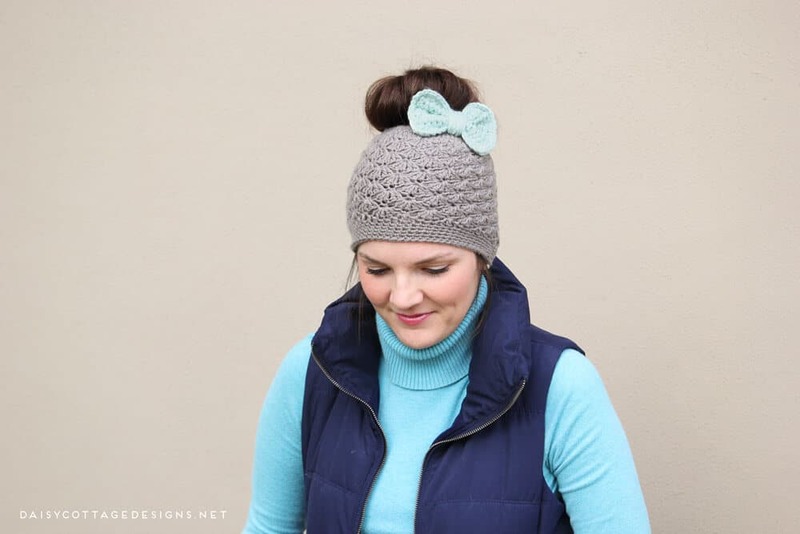 I think this might be my favorite messy bun hat yet (I think I’ve said that about the last two). The bow is done a little bit differently than the others, too. I like to switch things up a bit. 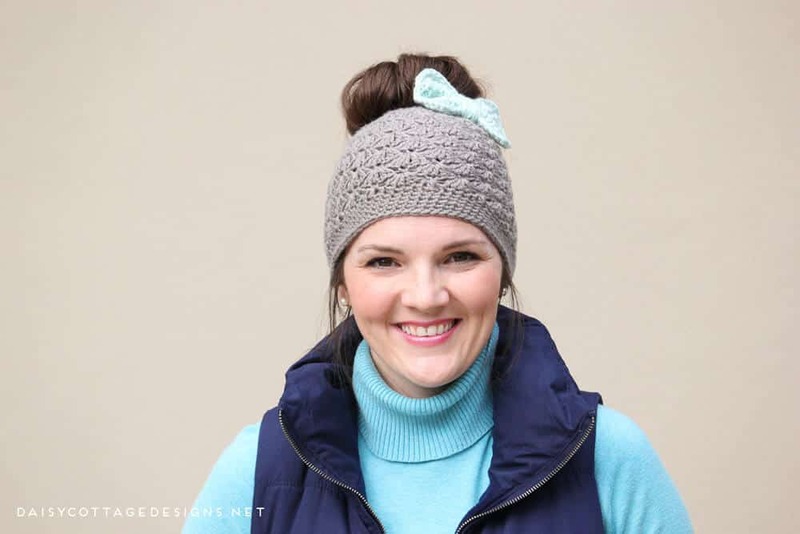 Ready to make this crochet hat for yourself? It might look like a complicated stitch, but if you follow the directions step by step, you should have no problem at all! This pattern is worked in the round. You will not turn your work. I crochet a little on the tight side. 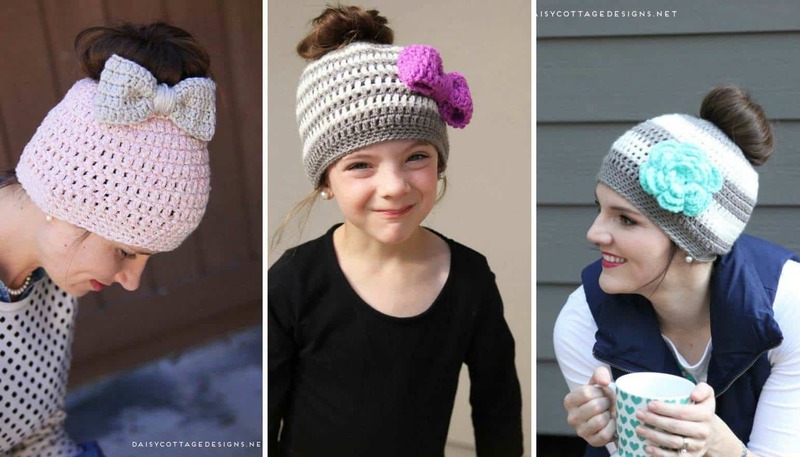 If you crochet loosely, you might want to go down a hook size. 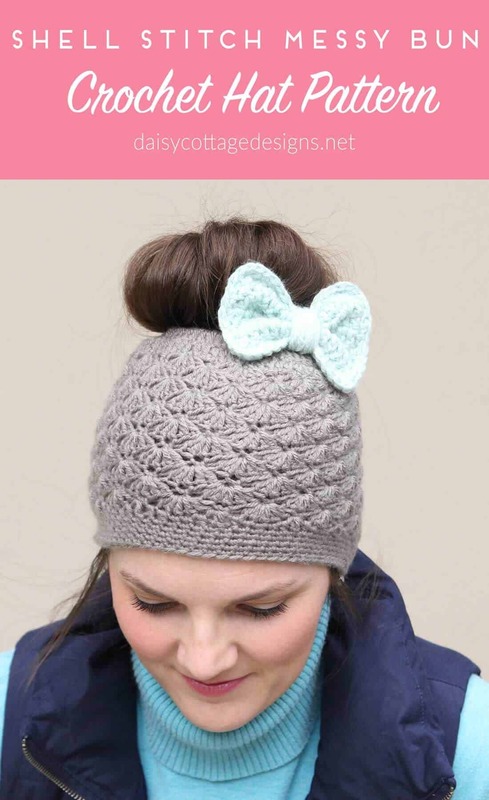 If you’ve made my other messy bun hats, you’ll know that those have an opening about the size of a hair elastic. This has a larger opening. It could easily fit over a bun that’s already formed. Remember, when you’re working into the chain loop, you’re not working into individual stitches. You’re working into or around the loop. Want the ad-free version to print? Purchase the PDF copy for $1.99 in my Etsy shop. Ch 37. Join to the first ch to make a loop. Round 4: 2 dc in the same stitch. skip 2 stitches. sc in the next stitch. *skip 2 stitches, 5 dc in the next stitch, skip 2 stitches, sc in the next stitch, skip 2 stiches* around. Work 2 more dc in the same stitch as your beginning ch 2/2 dc. Sl st to the top of the ch 2 to join. ch 1. Rounds 5-13: Repeat rows 3 and 4. At the end of round 13, ch 2 rather than just 1. Round 14: hdc in the next stitch, sc in the next 3 stitches, hdc in the next stitch, *dc in the next stitch, hdc in the next, sc in the next 3 stitches, hdc in the next stitch* around. Join with a sl st to the top of the ch 2. Ch 1. Cut yarn and weave ends. (My phone case is super cute, right?! It’s available here (affiliate). Note: Ch 2 counts as a stitch. Row 8: Now, you’ll be working around the edges of your bow (rectangle right now). Sc evenly around your entire bow working 3 stitches in each corner. Cut yarn and weave ends. Shape into a bow and wrap yarn around the middle to make the center of the bow. 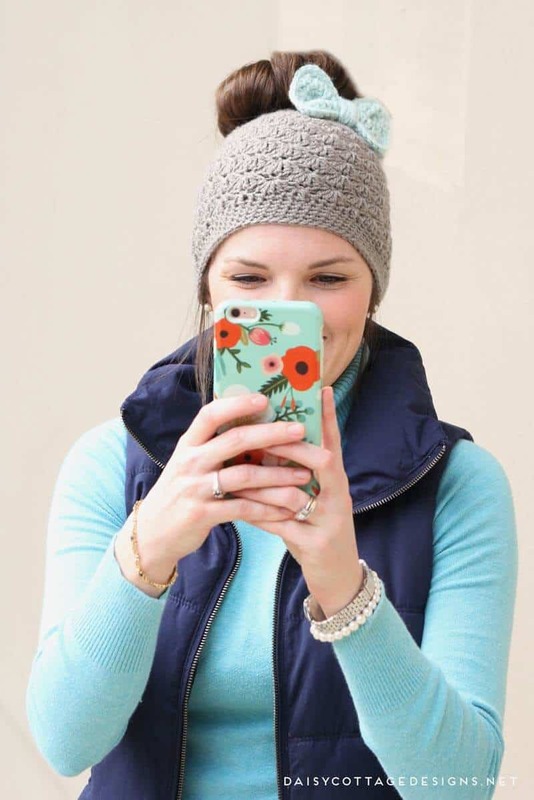 Attach to your crochet hat in any way you choose (bobby pins, alligator clip, sewing it on). 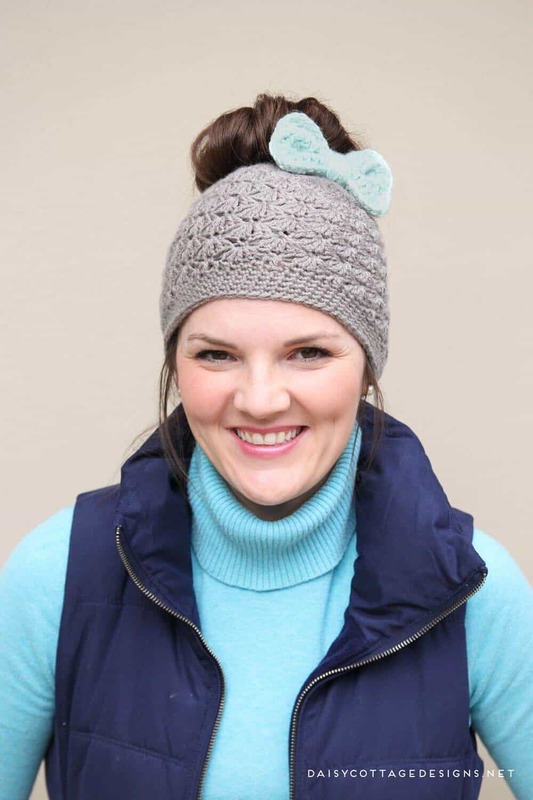 Thanks for joining me on this messy bun hat journey! Are we supposed to join after making 60 double crochet to the first double crochet and skip the chain 2 or just not join at this point? I did what the pattern said but it seems I should join somewhere. Or am I just being nervous about not joining. Your hats are beautiful! I’m stuck there too. Did you join the 60? Yes! You’re going to join! I just left that out accidentally. I’ll go add it right now. Another question 🙂 on row four am I supposed to skip four stitches after the first shell and work into the edge of the shell? I finished my hat ! It it was really fun to make and really super easy . Ignore my posts above everyone because I just wasn’t focusing on the instructions. I made mine in white 🙂 It is so pretty. Thank you for the great patterns . You’re not working into each of the chains 🙂 You’re just working around the chains. I am really confused on how to double crochet 60 into a chain of 37. I have 37 double crochets and am at the end. Hi, Amber. You’re not working into each chain. You’re working the crochets around the chain! Do you have any suggestions for downsizing this for a child? I made the bow last night and it looks way bigger that yours. Could almost pass as Mickey ears. LOL I made a big mistake somewhere. I still like it and will use it on the back, under the bun area. Now to try and make it “RIGHT”. Thank you for the patterns. You’re so welcome! If you find it’s big, definitely go down a hook size or take off a couple rows! Everyone crochets differently. Do you think it’s possible to do this same pattern around a pony tail holder? Question, I made this today, following your pattern. All counts came out exactly as your pattern stated, but this hat turned out very small. Fits my 2 year old, not me, lol. How would you suggest increasing the size? Do you think it would help to have a bigger hook & or increase the pattern counts? Hm…I would definitely use a bigger hook. Did you use worsted weight yarn?